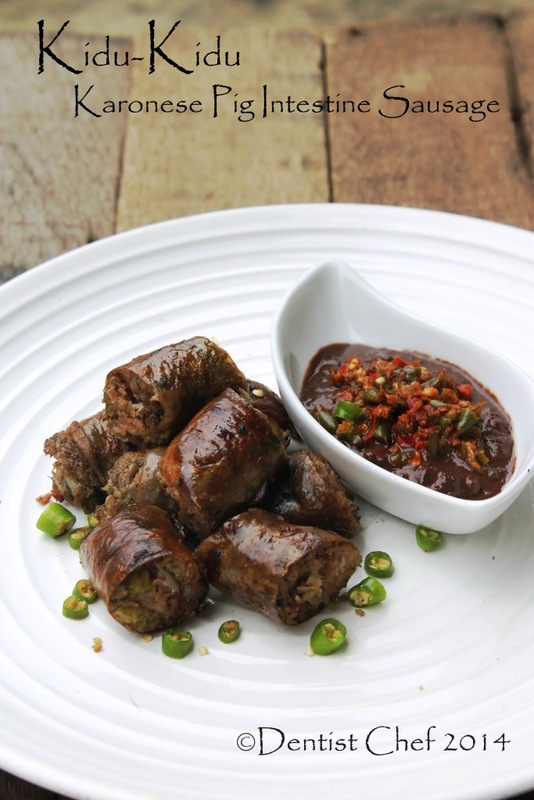 Resep Kidu-Kidu Masakan Khas Batak Karo, Sosis Usus Babi dengan Getah (Saus Darah). 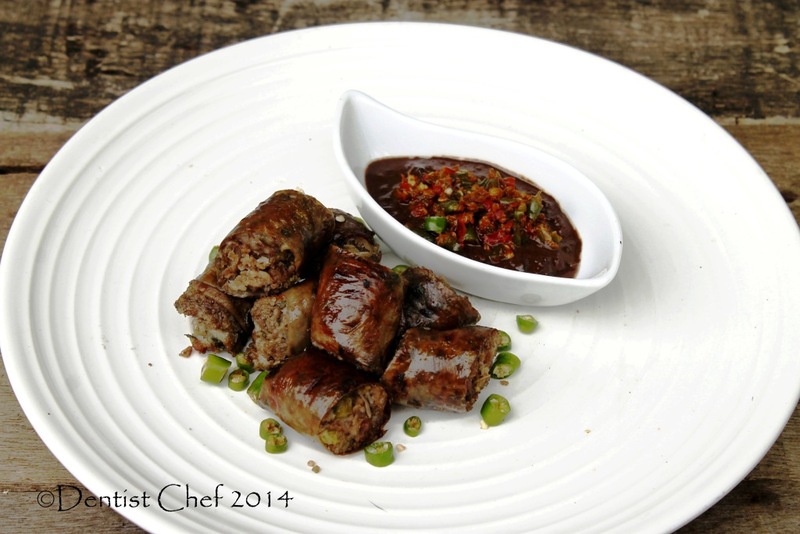 Kidu kidu is an Indonesian-Karonese Batak descent traditional grilled pork sausages made of natural pig intestine casing. Kidu kidu usually stuffed with finely minced pork and several kind of spices, gently boiled until throughly cooked and then grilled over charcoal. Cut into bite size pieces and served with getah or gota (spicy blood sauce with andaliman pepper). 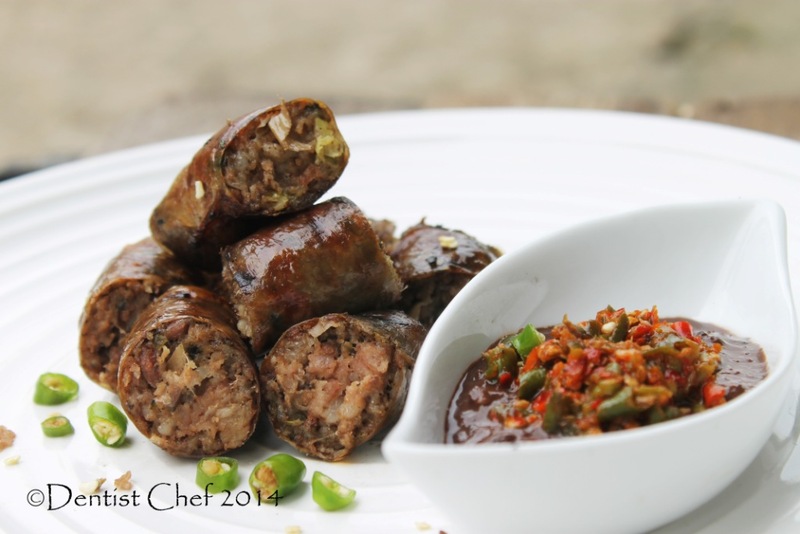 Kidu-kisu sausage is a festive occation threat, if you lucky enought you can found kidu-kidu sausage in kedai or lapo (Bataknese eateries), one slice of kidu-kidu served with a portion of Babi Panggang Karo (Karonese Styke Grilled Pork). You can ask for a portion of kidu-kidu that usually consist of 6-8 slices if you come earlier for lunch because kidu-kidu usually made only limited portion. Kidu-kidu sausage got a savoury and smokey flavour with bursting spicy and numbning sensation from the andaliman pepper, DAMN DELICIOUS!!! 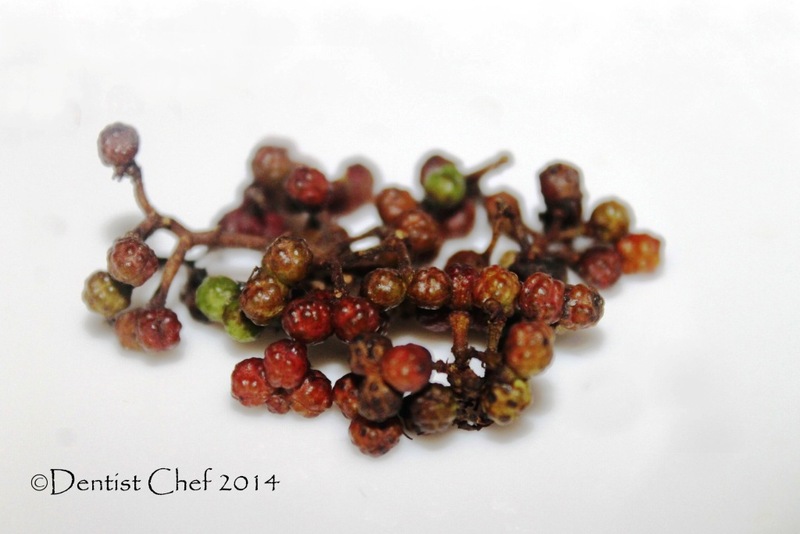 Andaliman pepper (Zanthoxylum acanthopodium native citrusy herbs similiar with Japanese sansho pepper or Chinese szechuan peppercorn that give a refreshing numbning and tangy citrusy flavour. Andaliman pepper or lada batak is an essential ingredients for kicking Bataknese cuisine; Ayam panggang napinadar (Grilled Kampung Chicken with Spicy Blood Sauce), Dengke Naniura (Raw Spicy Pickled Grass Carp Fish), Arsik Ikan Mas Khas batak (Spicy Fish Stew) and Saksang Ayam (Spicy Chicken with Blood Stew. You can replace the andaliman pepper with zcechuan pepper ot sansho pepper that usually sold in asian-chinese supermarket, it sold as a whole or ground dry herbs. Making sausage from natural pig intestine as a casing need a little bit patients to process the pig small intestine before using it. I always using pig small intestine for my Homemade Fresh Bratwurst Sausage Recipe and even my Homemade Dry Cured Chinese Sausage or Lap Cheung Recipe. This is How To Clean and Preparing Pig Intestine for making sausage casing, clean the small intestine inside out without trimming any fat membrane in the outside of the intestine. 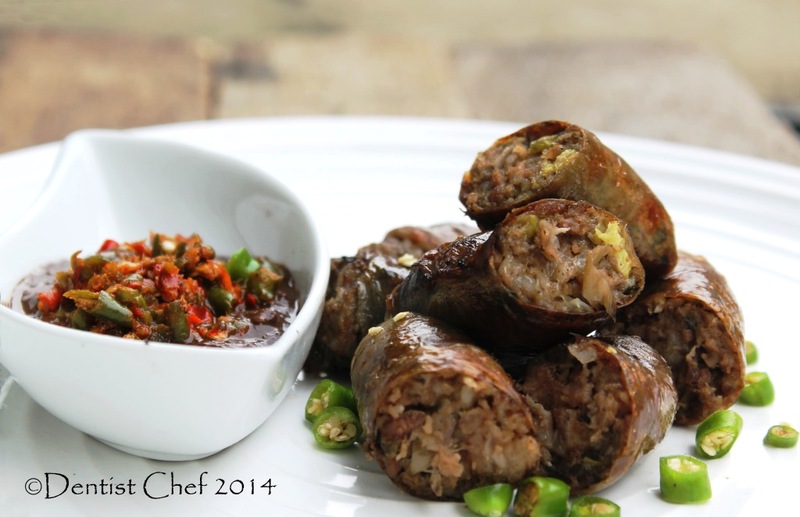 Kidu-kidu sausage usually grilled within the fat membrane still intact within the intestine to keep the sausage moist and tender. The fat also rendered within the direct charcoal grill until the pig intestine wrapper browned and crisped out. No need to cure the natural pig intestine with nitrite for making fresh sausage. You also can use edible artificial casings made of collagen and cellulose for making kidu-kidu sausage, but trust me; a little bit patients to deal with natural pig intestine casing really worth all the efforts. Sosis Karo kidu-kidu or grilled fresh pig intestine sausage stuffing consist of pork meat and fat with 20% or more of pork fat content. The stuffing ingredients minced finely manually with wooden chopping board and knives, that’s why the texture of cooked kidu-kidu sausage stuffing is a little bit coars. The seasonig for my kidu-kidu sausage consist of shallot, garlic, ginger, turmeric, corriander seed, nutmeg and andaliman pepper that processed until smooth paste. Finely chopped spring onion or scallion and bunga kincong or patikala (torch ginger flower) also added. 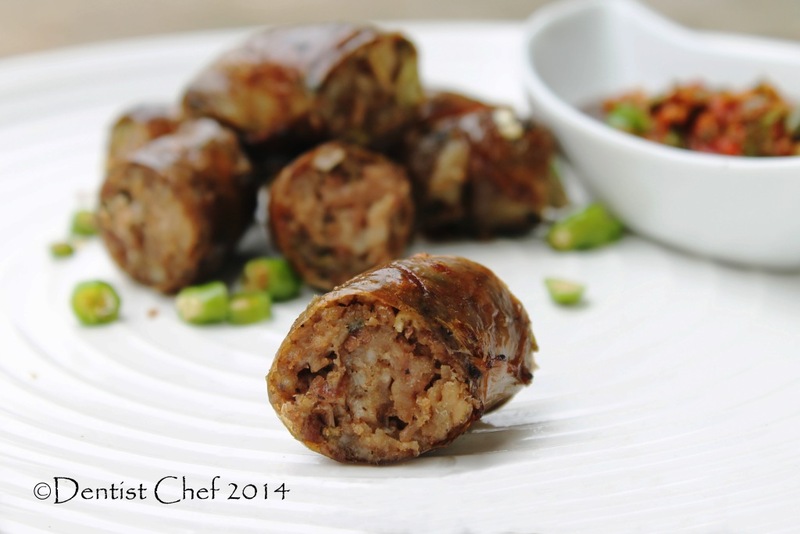 Some chopped blanched cassave leaves and chopped cooked pork liver and other offal parts sometimes added within the stuffing, it’s improved the texture and flavour of the authentic kidu-kidu sausage. Stuffing the pork meat inside the hog intestine is another fun part or making sausage. I’m not willing paid any money for fancy sausage maker made me using plasting funnel to stuffed my kidu-kidu sausage. Clean hand fingers or even chopstick is much more effective and fungtional to plug the sausage stuffing, just made sure you’re wearing a sterile gloves and sterilized chopstick otherwise it’s gonna be a mess. The end of the the pig intestine tied out after you finished stuffing to let the air released, slightly different with commonly people did because my plasting funnel tube didn’t long enought to be slipped with the intestine. the stuffing a little bit slippery on the instenstine because so many air bubble on it. The stuffing can be plugged better with your hand too, just squeese the stuffing out with the intestine tube to the end, then divide the sausage link by twisting and then tiding it to made individual homemade fresh sausage. Prick the fresh pig intestine casing kidu-kidu sausage with metal pin to remove the air bubbles is very important steps unless your fresh sausage will burst out during the cooking process.. After finished stuffing the kidu0kidu sausage, the pig skin sausage need to be simmered in gently boiling water to cooked it throughly. 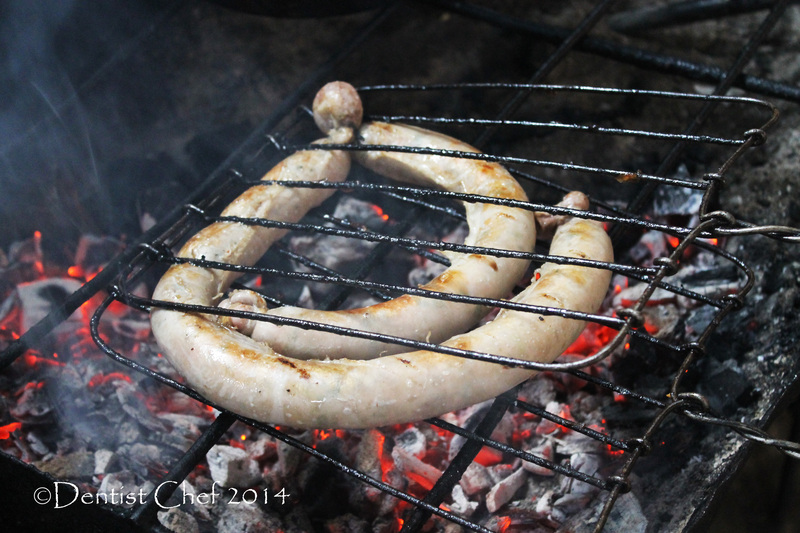 After that the kidu-kidu sausage grilled over low heat charcoal to render the fat on the pig intestine casing until browned and crispy. 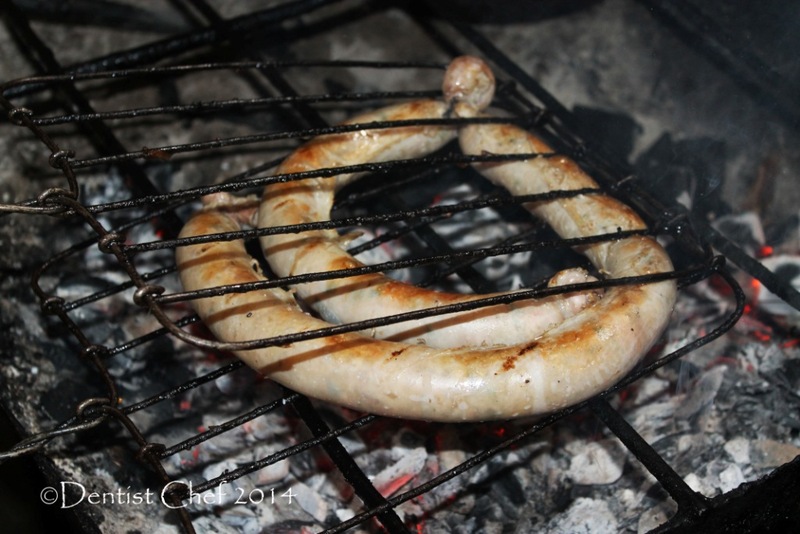 The grilling process also infused some smokiness within the kidu-kidu sausage. Now the gota or getah or spicy blood sauce, it should be rich, tangy, citrusy, spicy and how with bursting flavour of numbning andaliman pepper flavour. 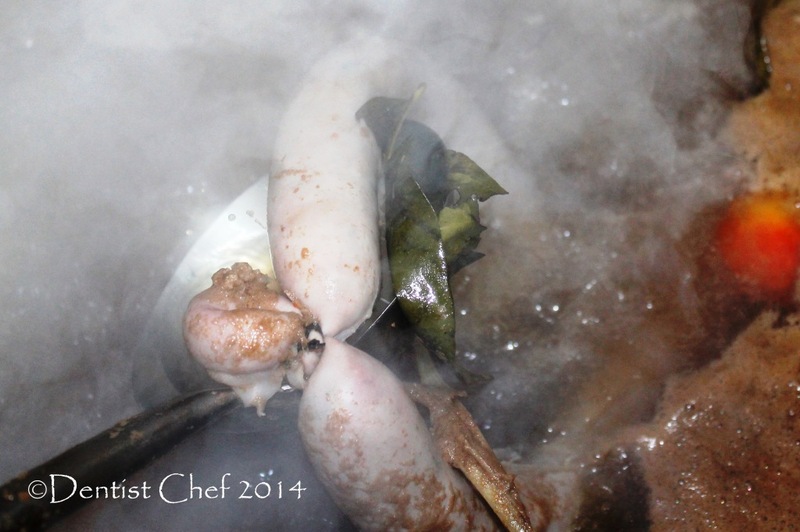 The pork blood dripped in a mixture of kaffir lime juice, salt and some water directly once it slaughtered. Mixed the blood gently to prevent it clotted, but if it’s clotted, simply processed it in a blender until the clot blood turn into a thick paste before added it to the sauce. You probably won’t slaughter your own pig, so please visit the chinese-asian market, they usually sold cloted block of pork blood, process it with some water before using it to make blood sauce. The basic seasoning is red shallots, ginger, galagal, turmeric, toasted corriander seed, bird eye chili pepper and andaliman pepper. All the ingredients of bumbu gota or seasoning is processed info coarsly paste and then sauteed with oil until the spice paste is cooked, fragrance and the oil dripping is separated from the edge of the spice paste. 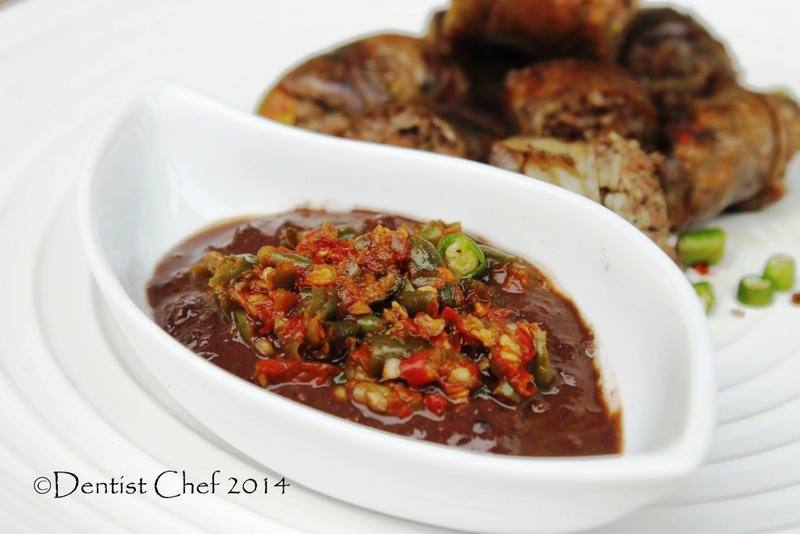 Juice from cracked and squeesed out buah asam tikala (torch ginger flower fruit) also added into the sauce. The heat is turn off and the blood mixture is poured and the bumbu gota sauce is gently stirred until smooth and then the stove turn on and the sauce is bring to boil and simmerred for about 5 minutes. Campurkan semua bumbu dan cincangan daging pada wadah (Combine all the spice ingredients and chopped meat in a large mixing bowl). Isikan ke dalam usus babi dengan bantuan corong plastik dan sumpit (Stuffed the sausage stuffing to the pig intestine using the plastic funnel and chopsticks or finger). 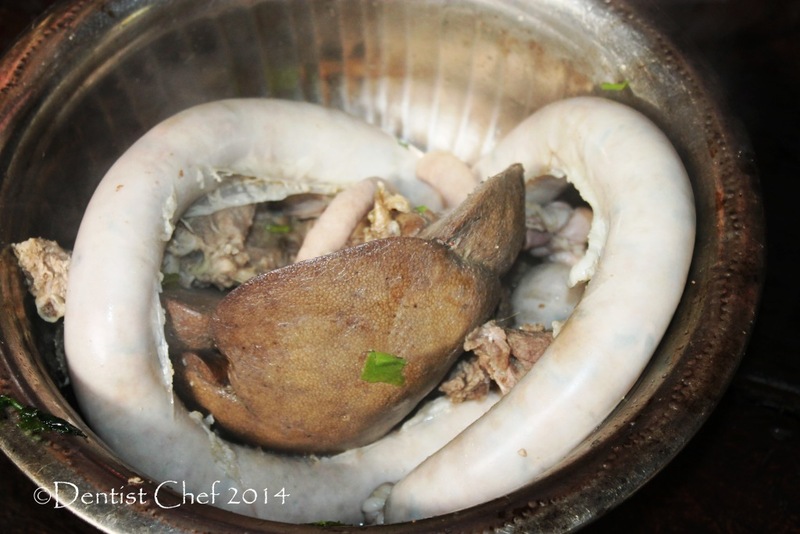 Ikan sosis kidu-kidu sepanjang 30 cm (Tie the pig intestine casing sausage into 30 cm links). Tusuk sosis dengan jarum metal untuk mengeluakan gelembung udara agar sosis tidak pecah saat dimasak (Prick the links and the sausage all over with a sterilized metal pin to allow the air bubbles to escape from the sausage to prevent is bursting out while cooking). 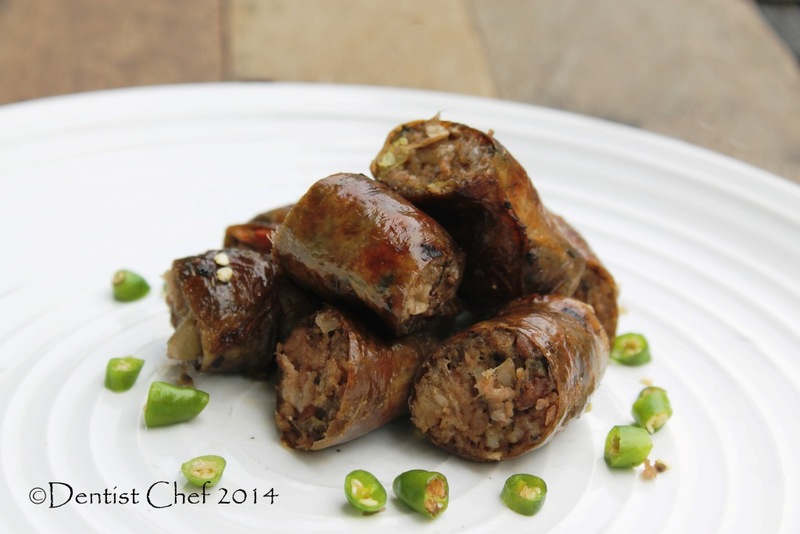 This entry was posted in Resep Babi (PORK), Uncategorized and tagged boiled pig intestine sausage recipe, cara membuat kidu-kidu, fresh dill and lobater recipe, grilled pig intestine sausage, hog intestine pork sausage recipe, homemade sausage recipe, indonesian pig intestine sausage, natural casing pig intestine sausage recipe, pork pig intestine sausage recipe, recipe pig intestine sausage, recipe smoked pig intestine sausage recipe, resep kidu, resep kidu kidu, resep kidu-kidu batak karo sosis, resep kidu-kidu karo, resep kitu-kidu panggang, resep masakan karo, resep sosis babi, resep sosis baby, resep sosis daging babi, resep sosis daging babi karo, resep sosis isi daging babu, resep sosis usus babi, traditiona pig intestine sausage recipe, wild boar sausage recipe, wild hog sausage recipe. Bookmark the permalink. A very interesting sausage recipe, Dedy. You are a master chef! Fun recipe! And good stuff — thanks. Fascinating! How do you find the time to cook up such a feast? It’s mind boggling! Oh, yes, you always give us such interesting recipes to aspire to! Yay more blood! Really awesome sausage skills there Dedy! Dedy, you’ve done it again! I’ve never heard of pig intestine sausages but I can imagine the flavor would be intense, in a really good way! Since you are into making all kinds of sausages I think you should give in and buy the right equipment. 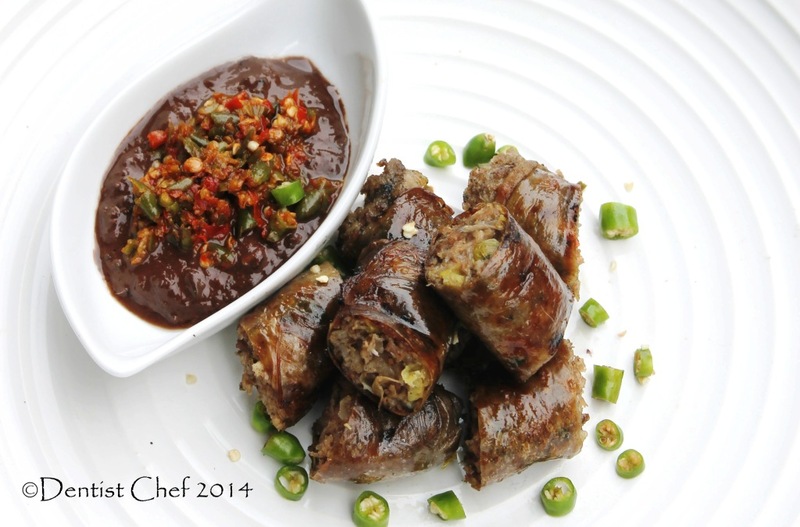 Hi Dedy, you should write a book on sausages, so many creative dishes! I have no idea why some people like smoky flavour. I don’t like it too much, only sometimes if the sausage is barbequed on a BBQ rack. Adding to what Cheri said, you should write a cook book. 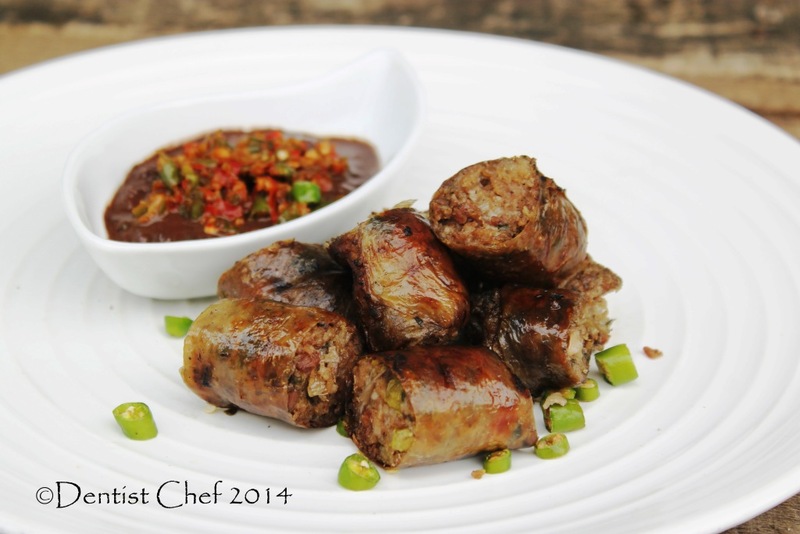 I haven’t tried sausages Indonesian style, but these look real good! Any left for me, Dedy?? Interesting recipe, not seen one similar before. Love your talented technique in your sausage making, Dedy! I can only imagine how fresh and delicious this grilled sausage is! Thanks for sharing! I have heard amazing things about blood sausage, this looks great! I remember making suasage with my grandmother, Dedy. She would only use pig intestines for the all day event. We didn’t use such interesting spices but they were always so good. I would love to try your method and your recipe. I bet it tastes delicious!!! I have never made sausage and I really doubt that I will…nevertheless very interesting…you are so creative and always making interesting dishes. This makes my mouth water. I love the photos!!!! Such an exotic dish and definitely appear inviting but I have to say no to. As always, your photos are fantastic. Dedy, I am very impressed, dear friend – this recipe looks like you invested a ton of time in it – and what a fabulous feast you created! We eat a lot of sausage in Greece! This looks fantastic! That sosi looks majorly delicious! And what about that sauce…? Great recipe, have to show my son since he loves to make sausages. It has to be delicious! Thanks for the unique recipe. Wow! What a dish this is. I’d definitely like to give it a taste. Yay! Sausages!! Before reading your blog, I was only used to the kinds of sausages I see in the supermarket ….which are nowhere near as interesting as yours!! I didn’t realise Indonesians had their own versions of sausages! Definitely would love to try one some day!